Zhengzhou CamelWay Machinery is an excellent Concrete Mixing Equipment manufacturer, the company has many types of Concrete Mixers, the capacity range from 500 m³/h to 3000 m³/h for customers to choose. And the Concrete Mixing Stations(HZS series Concrete Batching Plants) are also popular among the customers. 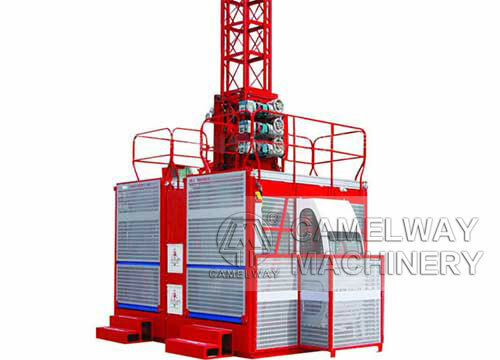 CamelWay Construction hoist, also called construction elevator construction, can also become an outdoor elevator, site lifting hoists. Manned cargo building construction machinery often used, mainly for the construction of high-rise buildings inside and outside decoration, bridges, chimneys and other buildings. Because of its unique cabinet construction allows construction workers to take up both comfortable and safe. Construction elevator on site with the crane usually use. General construction lifts 1-10 tonnes deadweight, speed is 1-60m / min. CamelWay construction lifter is a kind of gear rack drive elevator, construction lifters are widely used at the sites of industrial and civil construction, bridge construction, underground construction, large chimney construction, ship industry, which is convenient for transport of both material and human. It is convenient for installation and disassembly, also can be increased with the rise of the building. SC type construction lifter has very reliable electrical and mechanical safety system, is the construction of vertical transportation equipment with safe and efficient.